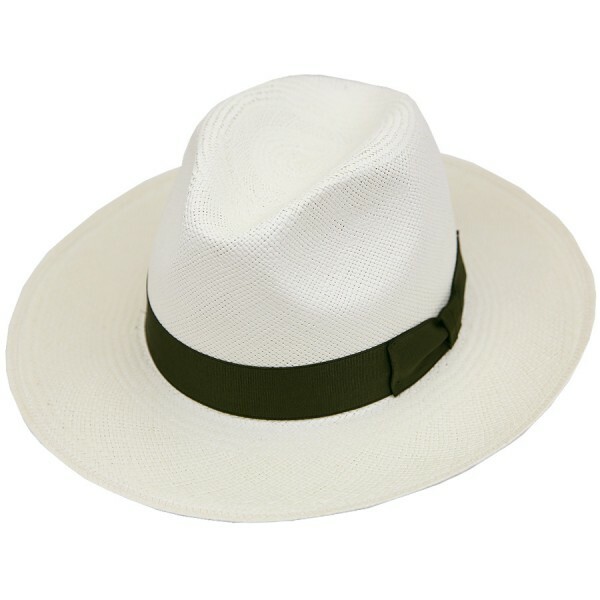 Product information "Panama Hat - Ivory - Olive Ribbon"
This traditional straw hat is manufactured in Spain from Ecuadorian Toquilla straw. So soft and light that you almost don’t feel it on your head; the open weave lets a slight breeze through while your face is still cool in the shadow. The sweatband is made of leather, the most expensive, sophisticated, lasting and comfortable solution. Once you’re used to the comfort and nonchalance a Panama bestows on you it will be hard to go without it in the summer. Made using traditional techniques and the highest quality standards in a small manufacture in Spain. The best materials, decades of experience and skilled workers ensure that each hat is a small miracle of craftsmanship. On the southern coast of Spain, a small, family-run manufacture produces some of the finest hats a gentleman can wear today. A classic, well made hat, be it of finely woven straw or classic beaver felt, is one of the most rewarding accessories a man can call his own. Even on the hottest of summer days, a classic panama hat lends a certain elegance and gravitas to the most informal outfits of cotton chinos, linen shirt and canvas sneakers. On the coldest winter days, a beautiful maroon beaver felt fedora completes the ensemble of grey flannel suit, navy overcoat and capybara gloves. There simply is nothing like a hat to elevate your outfit and bring you comfort in style. Related links to "Panama Hat - Ivory - Olive Ribbon"